The murders of several African-American Christians gathered at their church for Bible study in Charleston are truly horrible beyond words. The comments of survivors and family members to the perpetrator at a legal hearing are truly merciful beyond words. For in the midst of their terrible agony, they forgave the murderer, asked for God’s mercy upon him, and called him to turn to Christ in repentance. He gave them terrible darkness, but they responded with brilliant light. Jesus Christ taught that the eye of the soul, our spiritual vision, is all important. If we are illumined by His light to the depths of our hearts, then we will see everyone and everything in light of His kingdom and righteousness. We will seek Him first in all that we say and do. In the reaction of those grieving family members, we see the light of Christ in astoundingly sharp contrast to the darkness that inspired such an obscene crime. St. Paul suffered for Christ to the point of death as a martyr. He wrote of rejoicing in sufferings which ultimately give rise to hope “because God’s love has been poured into our hearts through the Holy Spirit.” Just as God enables martyrs to remain steadfast and even rejoice in their sufferings, He strengthened those grieving family members in Charleston to respond with grace, peace, and reconciliation that are simply not of this world. Their example reminds us that the Christian life is not about living in society on its own terms, which usually amounts to little more than stumbling around in the darkness and serving false gods of one kind or another. Since Cain and Abel, people have found reasons to become blind to their brothers and sisters, so easily viewing them as enemies deserving only of death and even to think of murder as virtuous. In our world of corruption, everyone easily appears as a threat to everyone else and there is no limit to vengeance from generation to generation. 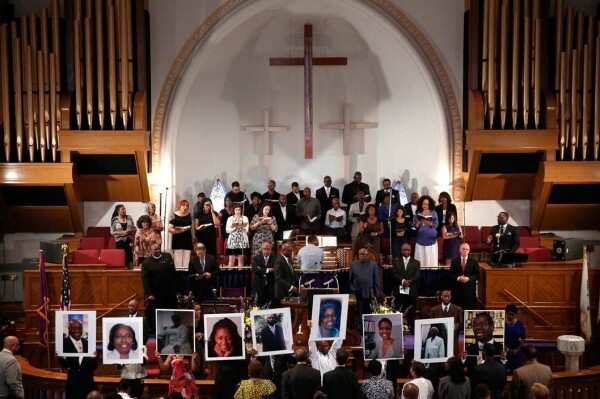 In the gracious response of the grieving family members of Charleston, we see a powerful icon of God’s love for enemies that should inspire us all to become more faithful Christians. For if we claim to accept His mercy to us, how can we not extend it to others? If we ask the Lord to forgive us our trespasses, how can we not forgive those who trespass against us? How can we rest content with hatred of anyone in our hearts for any reason? Of course, most of us fall into holding grudges and remembering the wrongs of others for matters far smaller than mass murder. We find ourselves serving more than one master with some frequency. The eyes of our souls are not full of light and we do not see everyone and everything in light of His Kingdom and righteousness. At times, we even get a perverse joy from defining ourselves over against our enemies, whether real or imagined. Consequently, we all need clearer and more focused spiritual vision. We all need to enter more fully into reconciliation with our Lord, into His peace. That is the only way that we will have the strength to love and forgive others from our hearts, no matter who they are or what they have done. That is the only way we will learn to see every human being as a living icon of Christ and recognize that what we do to them, we do to our Lord. That is the only way that the light of Christ will shine from our hearts and overcome the darkness with which we are all too familiar. The Savior’s teaching about serving two masters gets to the heart of our problem. Too often, we think of our faith as an optional addition to what is really important, to life as we want to live it in a secular world in which we have made God largely irrelevant. We seek possessions, pleasure, and power more than we do God’s Kingdom and righteousness. That is obviously not the Orthodox Christian faith, but I am afraid that most of us fall into such ways of thinking and behaving more than we would like to admit. In other words, we try to serve more than one master and the Lord is usually not the one who claims the greater loyalty. If our goal is simply a conventional life in society, then that way of living may work well enough for a time. But if we want to enter more fully into the peace and reconciliation of the Lord, we must not serve the false gods that only darken our hearts and wed us more closely to the very kind of anxiety and fear that are at the root of so much brokenness in our lives and relationships. Unfortunately, we so often do exactly what Christ warns against, making idols of our life in the world: our food, drink, clothing, and other possessions. That leads many to constant worry, for poverty, hunger, famine, crime, disease, war, and terrorism are always possibilities in the world as we know it. There is no way that we can protect ourselves completely from dangers far beyond our control. Too often, we cope with these worries by demonizing others and imagining that if our alleged enemies fail and our will is done then all will be well. We can easily feel justified in doing whatever it takes to build ourselves up and put down whoever we think stands in our way as though we were our own saviors. Of course, that is the way of the blind leading the blind, of a profound lack of peace of with God, our neighbors, and even ourselves. True reconciliation comes from the Lord’s cross and empty tomb. It is a gift, not our accomplishment. It shines through a life of mercy and forgiveness that overcomes fear, anxiety, and resentment. It extends to even the most wretched evildoers of every generation, from those who crucified our Lord to those who kill His children today, whether in Charleston, the Middle East, or elsewhere, and actually think that they have done something good. If we want to participate more fully in Christ’s peace and reconciliation, then we must use our worries and fears as reminders to call to God from our hearts for strength to put Him and His Kingdom first in our lives. If we harbor hatred or judgment toward anyone, we must ask Christ to help us grow in showing others the same forgiveness that we ask Him to show to us. If we do not see Christ in anyone for any reason, we must ask Him to flood the eyes of our souls with His light and overcome the darkness that is within us. If we are tempted to fall into despair about the great problems of our time, we must remember that the Lord has never, and will never, abandon His Body, the Church, through which He calls the entire world to salvation. Even as He sustained the martyrs of the first century, He strengthens those who die for Him to this very day. And in ways that go beyond rational understanding, He even empowers those who mourn to bless and forgive as He does. By His unfathomable grace, even those who suffer terribly may know “peace with God through our Lord Jesus Christ” and become full of light as they seek first His Kingdom and His righteousness.